Share your creative vision of JADE MOUNTAIN with us. NT: To create a cornucopia of organic architecture. It was imperative for us that this complex creative act was accomplished using the palette of indigenous materials lying at our very door step. Our mantra throughout, as well as being location, location, location, was as importantly also local, local, local. NT: The traditional daunting hotel corridor has been transformed. The adventurous journey to your sanctuary is via a long suspended sky bridge to infinity which is yours and yours alone. Your entry door is a massive rough hewn slab of exotic tropical hardwood. Your first step inside creates an instant spiritual uplift. 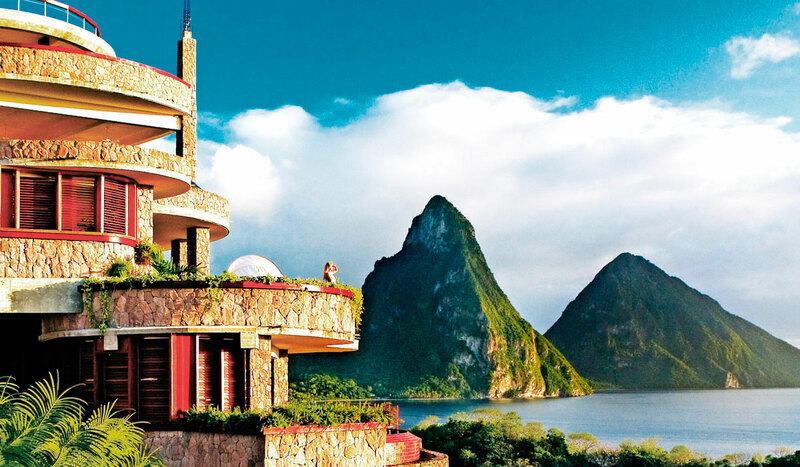 The infinity pool in front of you is a luminescent Persian carpet floating you out into space, to hover over the Caribbean Sea, hypnotized by St. Lucia's magnificent Piton mountains. We understand that all 24 sanctuaries differ completely from each other. Are there any elements in common? NT: The use of earth, air and water to give intense pleasure. The air has been cleansed by crossing countless miles of Atlantic Ocean. This air is the world's purest . If only you could bottle it and take it home with you. The Infinity Pool water is sanitized, softened and ozonated to the highest possible standard. The water's surface has been elevated well above your floor in a basin that puts it within arm's reach of your lounge chair for you to intimately interact with it. The earthy plants, stone walls and crushed coral finishes are all intimately connected to the environment. When you combine earth, air, water and the ethereal view in this way, I believe you unlock a potential for an almost profound and magical level of enjoyment and celebration. For more than 25 years, architect Nick Troubetzkoy has envisioned a uniquely natural resort on the island of St. Lucia: No telephones, no televisions, no clocks – just a complete separation from the workaday world in a setting of unmatched beauty. He’s realized his dreams in Jade Mountain, a marvel of organic architectural design and host to more than two dozen vanishing-edge pools and water-features set amidst hanging gardens. 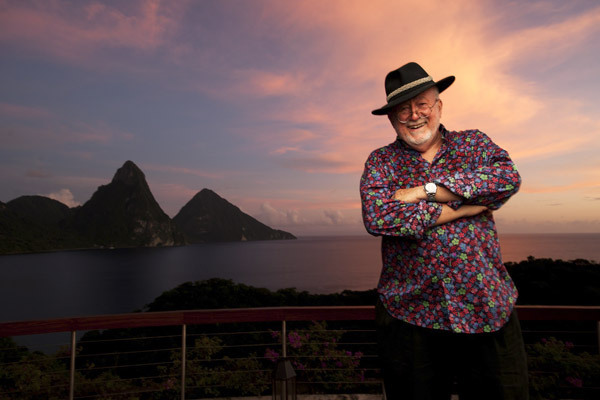 I first came to St. Lucia in 1970 to work for a Canadian architectural firm based on the island. As it has turned out, I never left. The beauty of St. Lucia’s landscapes, the warmth and character of its people and the unlimited potential to create something very special here captured my imagination. It’s a Caribbean paradise one must experience personally to fully appreciate and understand. When I first encountered the property that is now home to Anse Chastanet and Jade Mountain in 1974, there was almost nothing here – a handful of small bungalows nestled in the rainforest across maybe five acres of land. Amenities included four aluminum umbrellas and four plastic lounge chairs on the sand, and there was a lady who sat at the bottom of the stairs leading to the beach. She had a cooler filled with Cokes and a bottle of local rum, enabling you to enjoy the beautiful setting and have a drink. But the occupancy rate was very low and nothing about the place beyond the setting would make anyone want to come back. That has changed, I think, and for the better. It was my ambition from the beginning to create an environment that fully captured the island’s beauty. Whether or not I’ve been successful in that effort is up to others to decide, of course, but on balance, I believe that we have made this part of the island a better place since those early days while still retaining the essence of the old atmosphere when all you could do was sit by the water and enjoy a strong drink served by a charmingly hospitable St. Lucian. The first thing we did was open up the existing rooms to the environment. Simply by knocking out large portions of the walls, we found that each of the bungalows offered amazing views of the twin peaks known as the Pitons. From the start, those two magnificent mountains, draped in rainforest green, have always looked to me as though they’d been carved out of jade. Almost immediately, the new approach proved successful. People who came to stay felt as though they were connected to the surroundings: Our guests soaked in the views, breathed the fresh, clean air deeply and found release, relief and comfort. Why anyone who has a choice would want to stay in a room that closed them off from their surroundings was a mystery to me – and a notion that would later shape our work on Jade Mountain. The first resort we created on site – Anse Chastanet – was an extension of the original property and a tribute to the island and its remarkable beauty and tranquility. The suites could loosely be described as French Colonial, which is appropriate given the island’s history, and are spread apart in various locations around the property, some by the beach, others up on the hillsides. Each is different and has its own character, but what they all have in common is an openness to the surroundings that fosters a feeling of connection to the landscape among our guests. To do things in any other way when faced with such natural beauty just never made any sense to me at all. Through experience, however, I found that few hoteliers and resort owners saw it my way. Indeed, the development of Jade Mountain is in some respects a response to almost every hotel I’ve ever visited. I’m certainly not the most well-traveled person, but I’ve been very fortunate to cover much of the world and have always made a point of staying in or at least visiting the most interesting hotels and the finest suites they have available. In most instances, I found myself being disappointed by what I encountered. AN OPEN CONCEPT Typically, the “suites” in most hotels are nothing more than a combined set of standard hotel rooms in which some of the dividing walls have been knocked down to create larger spaces. Once such a space has been cleared, an interior decorator furnishes the room with quality period pieces that have been purchased and placed to set a tone. But the suites themselves, though larger, are really no different from any of the other rooms: You look out through the same windows as the rest of the guests and find yourself within the same architectural environment. On top of this, these rooms tend to be compartmentalized and bogged down in too many furnishings as well as distracting gimmickry and gadgetry. Rarely have I seen a premium suite that featured any kind of grand space. So I’d sit on the period chairs, look out my windows and always feel confined by the standard issue nine-foot ceilings, rarely finding anything that made me feel excited about staying in the room. This is the mode of design historically used in most hotels in most major cities – a cookie-cutter approach I’ve seriously come to question. What I’ve really wanted to do with Jade Mountain is re-evaluate and redesign the basic concept of a holiday/hotel experience. I wanted to create individualized spatial environments that would enable guests to forget about the furniture or the fact that they’re in a hotel room – in essence, to forget about everything but experiencing the psychology of the space on an intuitive level. This is why our traditional hotel corridor has been transformed into long, suspended, elevated, dramatic private bridges that lead each guest to a personal sanctuary, a personal vanishing-edge pool and a personal view. My goal was to develop public and private spaces and experiences that would give guests an ethereal, spiritual lift. This is why, for example, the ceilings at Jade Mountain are all 15 feet high: There is no sense of a structure bearing down on you. We also eliminated an entire wall from each room, opening the interior space to the glorious exterior. There are also very few right angles, giving the spaces a free-flowing geometry in which everything moves toward the exterior environment and the amazing views. In sum, we aimed to give our guests the feeling of entering a private space fully integrated into the island’s ecology. FROM THE HEIGHTSI came to these ideas early on. As far back as the 1970s, I remember asking our guests why we didn’t see very much of them outside their rooms. Consistently, I was told that they were sim- ply relaxing, breathing the air, basking in the surroundings and enjoying a wonderful sense of calm and peace. When you compare that experience to being boxed into a traditional hotel room, breathing recirculated, machine-processed air, the difference is enormous. Jade Mountain is my attempt to capture this set of concepts at the highest possible level and to vest it into a structure that looks, feels and is indeed a work of sculptural, environmental and elementally indigenous art. In turning this design philosophy into physical reality, we faced many formidable challenges, the first of the two most prominent being the extremely steep terrain. The site for Jade Mountain was chosen because of the way we could orient the structure toward the view of the landscape, the ocean and the Pitons – a prime confluence that could only be achieved on an extremely precipitous part of a mountainside. Indeed, there was really only one spot in the entire 600-acre property that accommodated the view without any compromise: If we shifted things too far to the left or right, hillsides or cliffs would have interrupted the views. In establishing the footprint of the building, we also determined that the structure could only accommodate six rooms side to side, which meant that moving up the hillside vertically was the only way to maximize the use of the space. That’s how the structure’s design emerged: It was a direct reflection of the land itself. Early on, we had planned to locate several villas throughout the property, but that idea fell out of favor almost immediately: We feared the project would’ve looked like an upscale housing development transported to St. Lucia from some urban center. In effect, Jade Mountain’s structure is a grand design solution – the answer to the challenge of maximizing use of the space without consuming too much of the land that makes the overall resort so attractive. The second formidable challenge had to do with building Jade Mountain without disrupting Anse Chastanet, which is located right alongside Jade Mountain and is fully occupied year round. We needed a special building contractor – one rigged for a silent operation and with a profound ability to twist and turn at Anse Chastanet’s command as a means of preserving its business. Our solution was to start our own full-fledged construction company: This gave us total control at all times. LEVEL BY LEVEL Of course, building a large, multi-level building in such a locale is an extremely costly and difficult proposition. Just establishing the footprint involved constructing massive retaining walls and foundation structures. And not only was it a fantastically difficult site logistically, but there was also the problem of the physical labor required to build anything on a tropical island, let alone a towering freeform structure made entirely of reinforced, cast-in-place concrete. On the design side, there’s no denying my background as an architect and the influence of people I’ve worked for and with or have admired through the years, but to the largest extent possible, Jade Mountain is entirely original, basically because of the way it responds to its site. In fact, the final design only began to unfold during the construction process: We created forms in which to place steel and pour concrete one level at a time, essentially improvising as we moved upward. With each level, in fact, a large part of the creative process occurred as we were placing the freeform plywood plates upon which we set the reinforcing steel and hand-poured the concrete. Simply put, a number of elements within Jade Mountain defied architectural convention. There are, for example, very few dividing walls that are directly on top of other walls. There are some, of course, but for the most part each room and each level are completely different from the rest, and there is no structural patterning of the building in the traditional sense. This unusual approach forced us con- stantly to consider the structural aspects of the building and adjust our structural and design component interactions as the work progressed. Structurally this meant that we had to develop some extremely creative mechanisms for transferring the weight of locomotives (in the shape of swimming pools) from vertical walls to horizontal floors and across significant spans. One of many problems facing those who worked on the project was that the building appeared to be in a constant state of change. But in this case, “change” didn’t mean ripping things out and starting over or going backwards. Instead, we were very careful in the choices we made and were sure, by the time we took each incremental step, that we were making the best possible decision. In a sense, it was as if the structure incrementally evolved. This procedure required intense and constant site supervision by the entire team. SCULPTURAL FORMS For me, however, it was always about the rooms, the sanctu- aries: In everything we did, we kept the experience of living in these spaces in the forefront. As we progressed up to each successive level, we also examined everything with site lines and viewpoints in mind and established the design parameters for each successive level in advance of starting any new level’s formwork. As the design unfolded and the building grew floor by floor, we were essentially sculpting shapes out of concrete with the wooden form- work as our tool. From an engineering standpoint, this approach meant that we had to create the structure in such a way that we were never limited by any lack of structural strength in the levels below. In other words, we literally had to stack the deck to give ourselves the freedom to create whatever we wanted on the upper levels. This is an unusual way to work in a day and age when modular, stacked construction is the norm, and it meant that all of the collaborating designers, engineers and project managers had to be on hand to accommodate emerging technical needs. The resulting design tended to include lots of curves and few sharp angles, and most of the design elements are free-flowing, including the pools. It was extremely demanding, but we took no shortcuts in the form of repetitive design elements or structural motifs. Because of the remote and precipitous location of Jade Mountain, there was no way to deploy the usual armada of concrete delivery trucks. In fact, the entire structure, which encompasses tens of thousands of cubic yards of concrete, was all prepared in countless batches in household-size concrete mixers scattered around the site on small ledges carved out of the hillside. All of the concrete was “delivered” by means of chutes and wheelbarrows and poured by hand into the formwork. It was an incredible process that called on hundreds of intrepid workers all drawn from the local community. They put in thousands upon thousands of backbreaking hours in build- ing the forms and mixing and pouring the concrete. It was remarkable: On the one hand, we had this unusual, improvisational design and engineering work going on each step of the way, with all sorts of lively give and take among some brilliant and creative people. On the other, we had a determined labor force crawling all over the mountainside, constructing Jade Mountain one plank, one nail and one shovel’s worth of sand, cement, gravel and concrete at a time. For much of the project, it really did seem as though we were attempting the impossible. MATERIAL ESSENTIALS From the start, we always wanted Jade Mountain to feel like a natural extension of and a tribute to its island environment and the Caribbean. That ethos influenced every aspect of the design, especially when it came to the selection of materials. Basically, we decided to look down at the ground and use what we found at our feet, allowing the island itself to dictate much of the color palette and materials selections. The sand and gravel we used for the concrete, for example, is drawn from the property itself. We set up our own mining and rock-crushing sites – a tremendous advantage because we didn’t have to import all that material. The rose-gray, hand-split stone cladding material used throughout was also sourced on our property and from other sources on the island.And when it came to materials we couldn’t find close to home, we turned to our Caribbean neighbors, bringing in blush-colored coral finishes found in Barbados, various tropical hardwoods from Guyana and an array of coral tiles from the Dominican Republic. All the water used to fill the pools and supply the rooms will come from our own system of reservoirs, which have been designed to hold three million gallons of water and feed our on-site water treatment plant. And all of the water comes to us in the form of rainwater that feeds an extensive year-round system of streams. We also established extensive millwork and fine-woodworking operations on site, and most of the woodwork and many of our furnishings were made here using dense tropical hardwoods. (This material was harvested in Guyana using principles of sustainable forestry.) More than two dozen fantastic wood species have lent their subtle colors and textures to Jade Mountain in rich and sometimes surprising ways, including Bloodwood, Cabbagewood, Etikburabali, Taurino, Locust, Ebony, Snakewood, Futukbali, Mora, Kabukali, Purpleheart, Monkey Pod, Satinwood and Rosewood. Our woodworking facility turned out thousands of custom wooden components, including every door – some of them 12 feet tall. And every louver window was handmade right here. We also have our own garden nursery, where we’re currently propagating thousands of tropical plants that will be used to landscape the building and the surrounding areas. This process in particular will take an indefinite period of time, as our goal is to drape the structure in greenery in ways that will evoke images of hanging gardens and of the iconic Pitons themselves. In all cases, we’ve dedicated our efforts to environmental conservation and preservation: We have used absolutely no clear-cut wood, for example, and we set up our quarrying operations to occupy the smallest possible footprints. We even treat our own sewage, sending it to aerobic reed beds and preparing it for safe use in our irrigation systems. What I’ve covered here, of course, is nothing more than a scratching of the surface, a taste of what the project has been about through the past 25 years. There are so many other things I might have discussed, so many details that will make our guests want to return again and again, but space won’t permit it. Let me conclude by letting you know it’s a special place – one you should probably see for yourself.